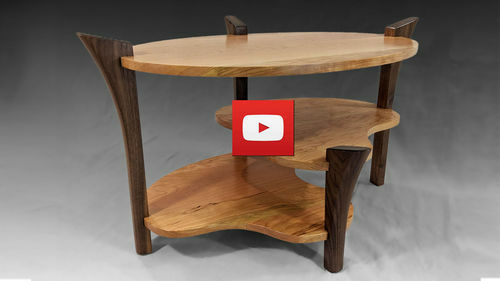 Here’s my oval table I built with abstract shelves and sculpted legs. I used Cherry for the top and shelves. The legs are walnut. This has been one of my favorite designs to date. BEE YOU TEE FULL !! I am subscribed to your channel and I will be watching your video tonight. .........and at some point in my life trying to recreate this project in my garage/workshop. Everything just seems to float, love the free-formedness! What a great design! Love it. The combination of the cherry and walnut really works with the design. I enjoyed hearing your design decisions and seeing your execution. You had some nice techniques in there that I hope to remember when I need them. The piece looks great. Well done. love your design on this brian very unique,and i also loved your video on making this,all your videos are great.thanks for taking the time to do this,its very much appreciated. Beautiful design and great execution with pleasing shapes all around. I particularly like the shape of the legs. Your video is excellent too—lots of nice tips and a straightforward presentation. Beautiful table. I love the design!! Beautiful table – wish I had half of your creativity and ability. Nice work.